There is not too much Christmas feeling this year. Does anyone feel the same? I just feel this Christmas in Shanghai is a pretty plain and simple holiday, unlike other Christmas. Anyway, for all my friends who celebrate Christmas, Merry Christmas, especially to my friends outside Shanghai (hope you have better atmosphere there). My neighbor knocked at our door this afternoon, and asked me to look at an apartment upstairs. They are transforming the apartment into a group rental suite. It is like shared rooms – many people share the same apartment to lower the cost. But it is not exactly shared room. It is a very professional business. It transfers some good apartment into a new type of suite – separate the rooms into several independent rooms and rent it out separately. The biggest difference between group rental and shared room is, either the number of people living in the room (low end group rental), or the change of the house structure (high end group rental). The low end group rental is pretty obvious: they put 20 beds into one apartment, and there are 4-8 people living in the double deck room which was originally designed for one person. 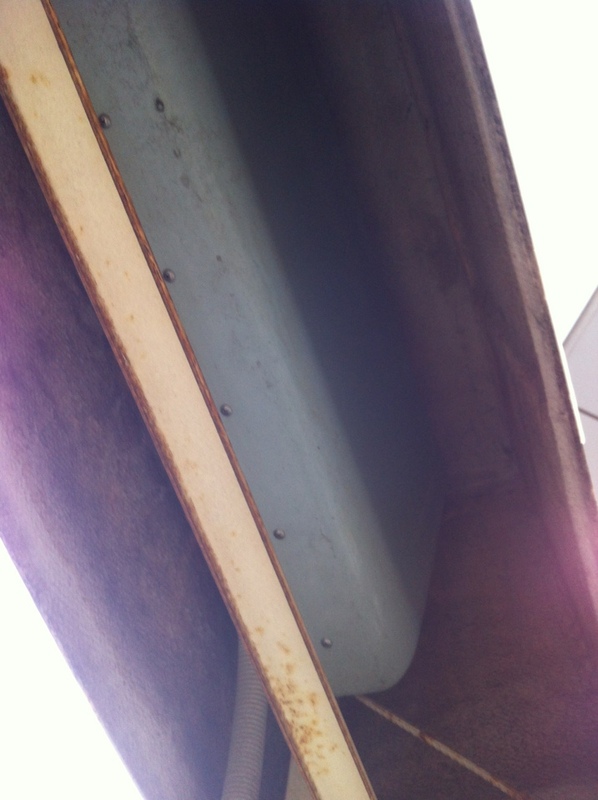 That is very annoying and cause security and fire risks to the building and other residents. I have visited one pretty high end group rental. It is located in a top residential area, and it is a normal suite from outside. But when you enters, there is a long hall way, and there are 3 secure doors on the right, and two on the left. It is that type of door used for external doors – robbery proof and noisy proof. Each tenant has two keys: one for the external public door, and one for the private door. On the left, if you open a box, there are five separate water meter, and electricity meter. For the rooms, every room is equipped with bed, TV set (with satellite! 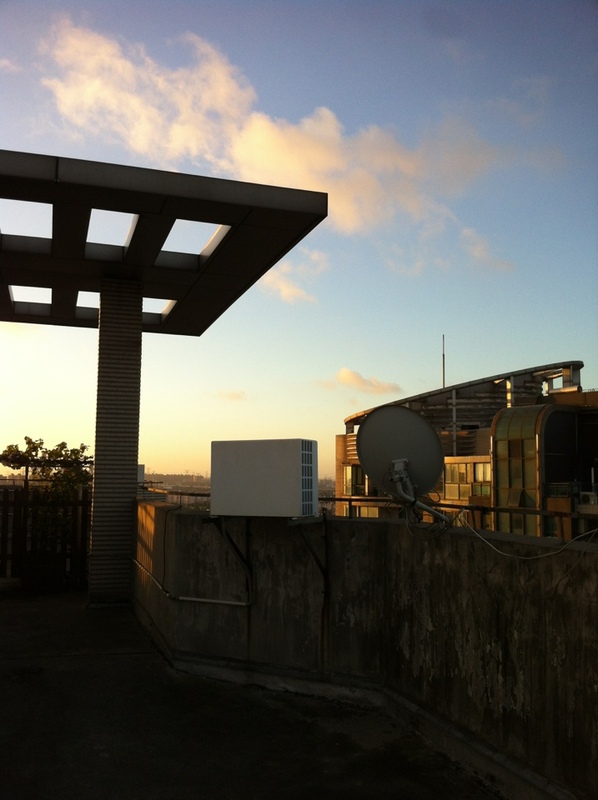 ), network cable, micro-wave, and a shower room. Due to the constrain of the original house, they share the same rest room. The cost for such a room is about 1000 RMB. I was very impressed when I saw this. Think about the value of 1000 RMB! It is like a residential suite with everything you need as a single, and it enjoys the same view and service as other residents in the top residential area (look at the big grassland downstairs). The benefits for the tenant, and owner of such property are obvious. Cheap but good place to stay, and higher return than renting the whole out to one tenant. It just needs some professional work. The problem is for the neighbors. What if there are a lot of people living in the same area designed for households? They change all the time, and they are more like party guys, and they by pass all the security checks – tend to leave all the doors open since they don’t have enough door passes. 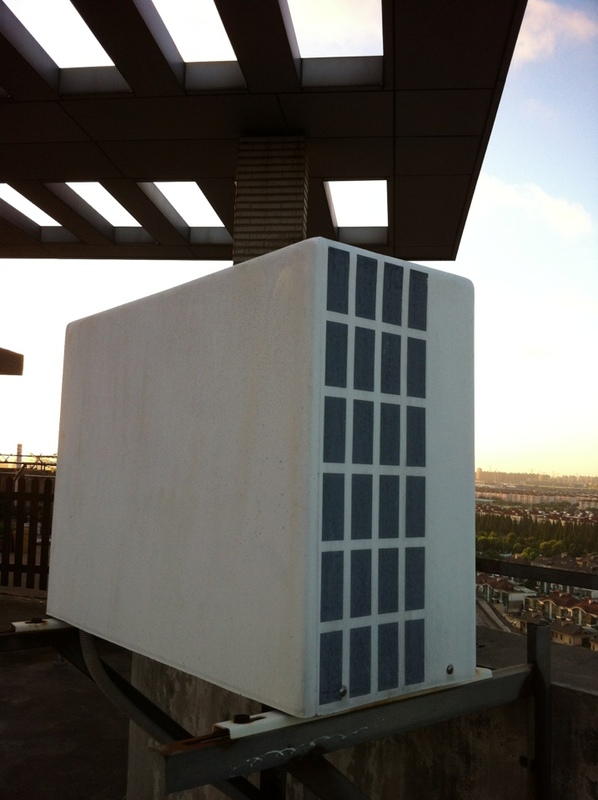 It brings additional burden to the building, and cause all kinds of risks that a residential area shouldn’t face. So, back to my story. When we found it out, the room was under construction. Workers are shipping many security doors, many hot water machines into the room. It is obvious that all the stuff were used. I guess they were just kicked from another residential area. Many neighbors gathered, and wanted to do something. Then, the problem is, what can we do? I described this dilemma in another article . Without a working legal system, everything is within the same government/party system, and you have to keep your finger crossed to have a “good person” handling the case. The property management company obviously don’t know what they should do. They said they will report to “the above”. That’s it, and I don’t have any hope about what they do. Then I called 962121, the hot-line by the government to solve this type of complain. They promised 15 days to call back. I have kept the tracking number. I am aware that I started to complain more than few years ago. I acknowledge the change, since the more I interact with this society, the harder I feel to get things done. Not just me – I think many people face the same problem. For small stuff like this, I tried to use my own way to solve it, although I know a better solution is call my friend in the government – Hmmm. I don’t like to do it that way. But for really big things like getting my son into a kindergarten, who knows what I will do? In a twisted and weird society, you just cannot say, “I will do anything for my son”, or “I will do anything for my principle”, because you find yourself in a strange position when the two conflicts. Don’t be shocked by the firm tone of the title. Well. I would say, my three most favorite places in Pudong for coffee or dinning. 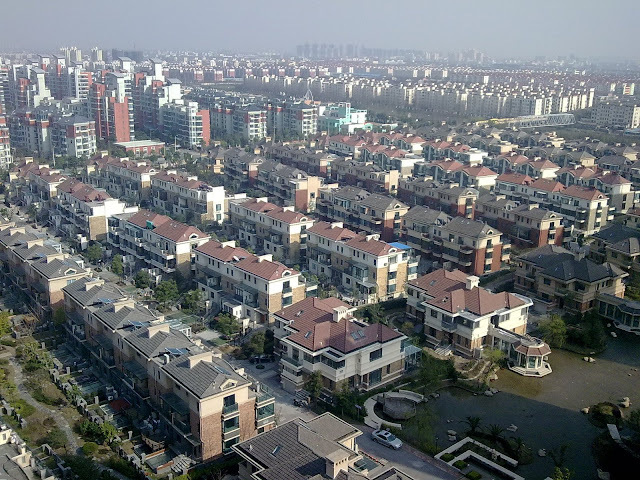 When Wendy and I bought our current apartment in 2003, many places in Pudong seem empty (except the Lujiazui area) while all of them seem promising. We choose somewhere that is, basically a suburb area, AND is promising. I already said: "Bye Bye, Pudong", and "Continued to Seek for an Apartment", but finally decided to move to Pudong so my "Life in Pudong Started". If you are interested, maybe you can use the time-back machine (my blog entries) to understand why. 5 years past, when we reviewed our decision, we can see it more clearly. In the last 5 years, three really good neighborhood emerge, according to my standards – good restaurants, good coffee shops, and good environments. 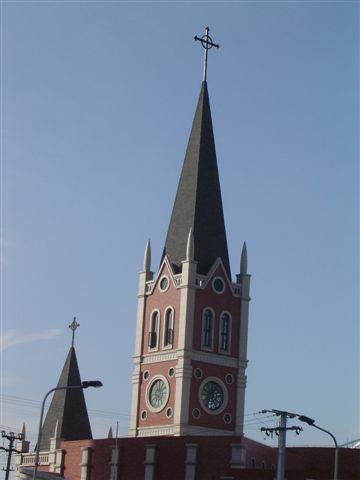 The first one is the Biyun International District. The shops and restaurant near the football court is great. 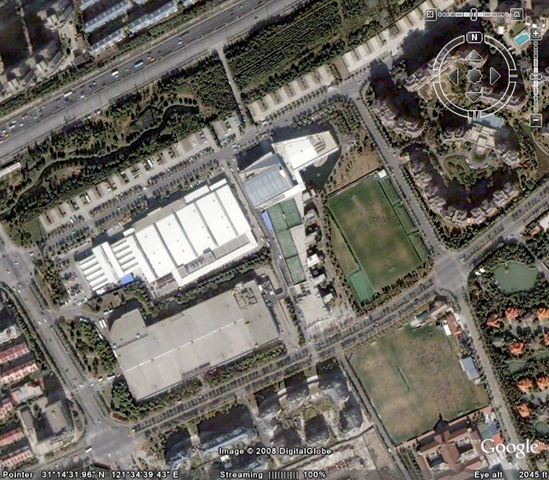 The second is the Liangyang Neighborhood. 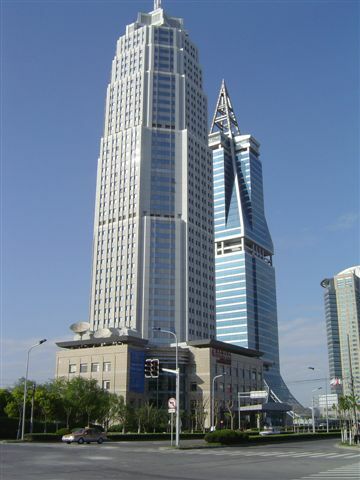 The Thumb Square is an emerging center in Pudong. There are hotels (Radisson) and restaurants, and shopping centers. 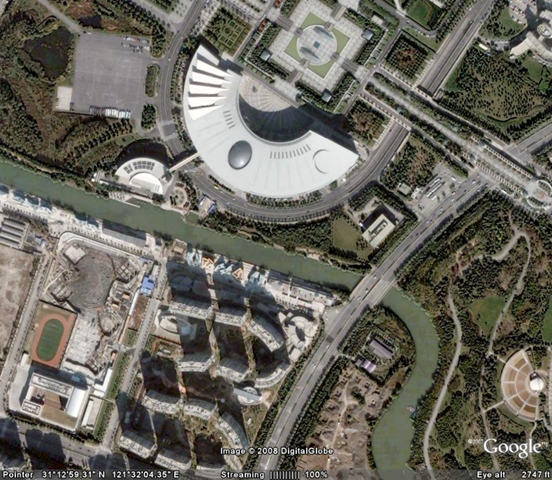 My favorite – very rare in Shanghai – they also have a Zendai Museum of Modern Art. The third is just opened. 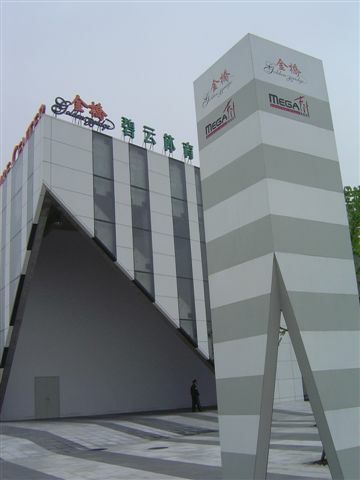 It is Jinyan Road, on the other bank of the River (Zhangjiabang River) of Shanghai Science and Technology Museum. A Starbuks coffee was opened one month ago, and become the nearest Starbucks for me. There are many other areas in Pudong that are nice, but these are the most frequently visited places for me. Hope you like it. 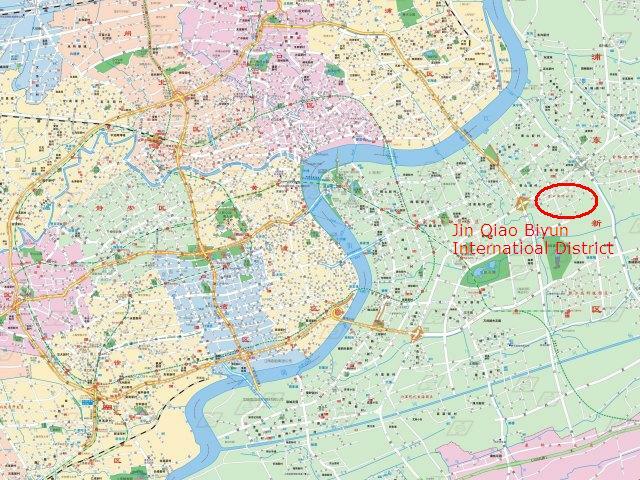 With the World Expo, maybe, the south bank of the Huangpu River may start to boom, and with the plan of a new commercial center one block away from my current apartment, I hope another "nice neighborhood" start to grow near where I am. 5 years ago, there are no such places in Pudong, and now, it turned to very good and promising places. In the next 5 years, I hope not only more and more buildings were built (I don’t want to see it), there should be some good "neighborhoods". This term is not familiar to many people, but with the emerge of the nice places I mentioned above, people may start to love the feeling that a place is not only building, but there are streets like I showed, and there are LIFE in it. I am looking forward to seeing more "raising stars" in Pudong. It is not news that someone predict the drop (serious drop) in real estate price. This oppinion was strong three years ago, and is still strong today. The reality, however, is just on the opposite part. Today, when Wendy and I walked around the neiboughood, and past the Sales Office. Out of curious, we stepped in and was astonished by the current price of real estates. Wendy and I bought the current apartment in 2003. 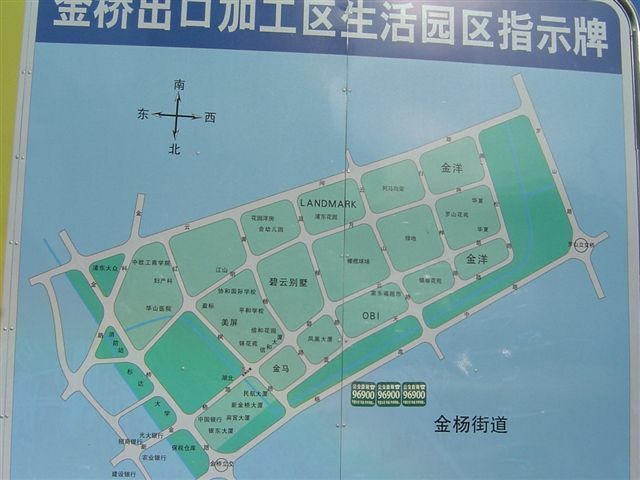 At that time, the price as 5900 RMB per sq. meter. Today, when we asked the price at the same location (just the other side of the road), it turned out it is already 18,000 RMB per sq. meter. If we consider the price of 3000-4000 sq. meter in early 2003, that is 3 – 4 times increase in 4 years. 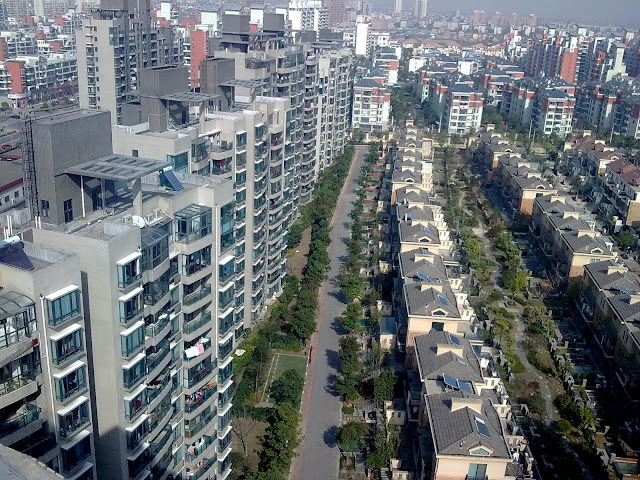 For good quality aparments, the “reasonable” price already raised to 20,000 – 30,000 RMB per sq. meter. 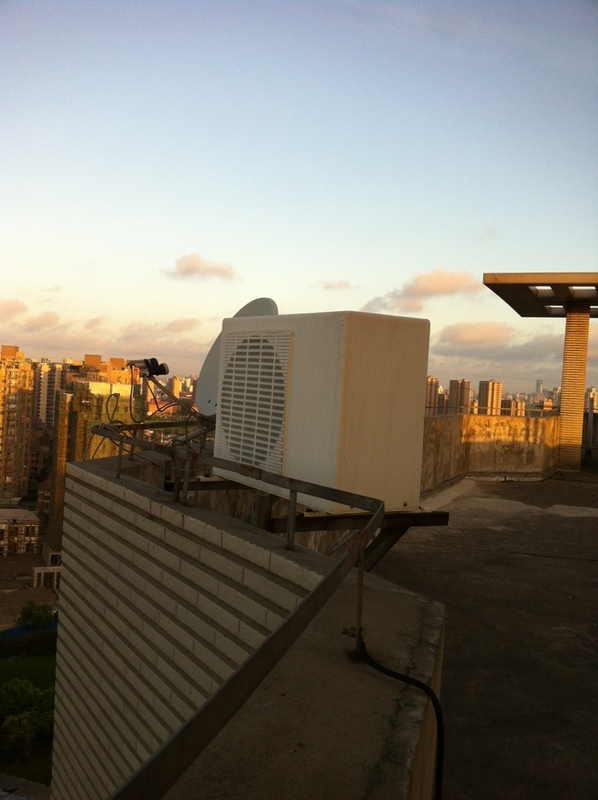 This high price was only seen in the houses along the Huang Pu River at the Lujiazui area 5 years ago. Now, it is common price. I am very confused, and the price seems keep going up dramatically. Just get back from my good friends new apartment at Vanke Holiday. 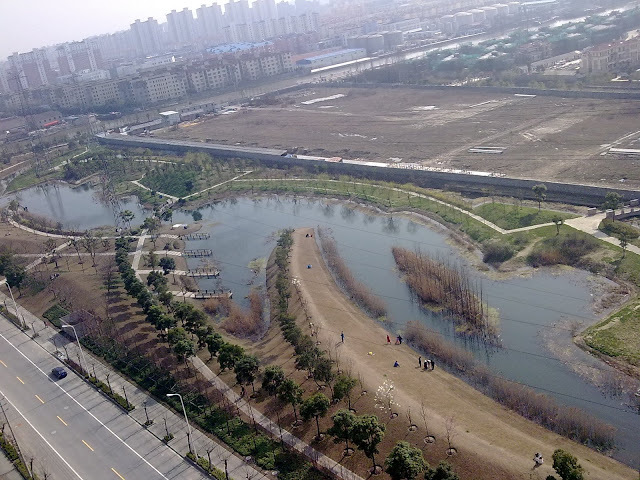 It is another good residential area by Vanke. I am a big Vanke fan. Our first apartment was in Vanke, and I spent great time there, before I moved to Pudong. Vanke is the No. 1 brand in the real estate industry. 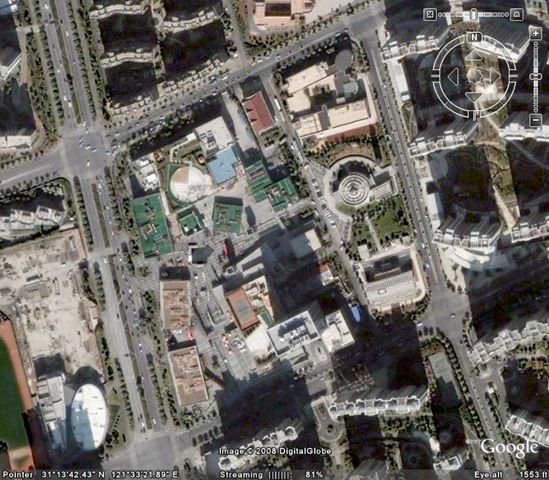 It has the largest revenue number, and good at build vast area of residential buildings and turn suburb into new towns. Sometimes I wondered why companies with huge amount of capital didn’t invest in the booming real estate industry. For example, Microsoft and eBay, and Yahoo! may get better gain in China by investing in real estate if they did it in 2000. It turned out the idea is naive, since recently, I understand every company has its unique expertise. If you gave 100 million dollars to Vanke and ask Vanke to build a new town, they can spend the money more effective, with lower cost and higher price than other companies can. It is the same to invest 100 million dollars to Microsoft, and they can do better job than Vanke in software industry, and eBay on eCommerce… That is the reason every company focus on their own field, instead of going into too many industry. Many big companies in China entered too much (they call it diversity in business). Some succeeded, but more companies failed to do that. In a more efficient market, the concentration of expertise will be even more clear, so the smart decision is to stick in one industry, and deliver really good result. It seems the turning point of the Shanghai Real Estate has appeared. It seems to me that the price of real estate in Shanghai (one of the hottest topic) is turning down. Evidence: 1. The latest flyer I got from my mailbox about the price of the apartment was lower than the last quote – the first time in the last several years. 2. More and more real estate brokers closed their business because the limited transaction cannot support the rent. Interesting observation. I didn’t read about the WIRED article before I wrote this blog. I would say, the majority of the content is accurate. WIRED magazine editor was very professional. They sent me a fact sheet and asked me to verify all the detail facts before they went to publish it. I had actually corrected some key facts. For example, my Goudaner is a FIAT instead of a VW. 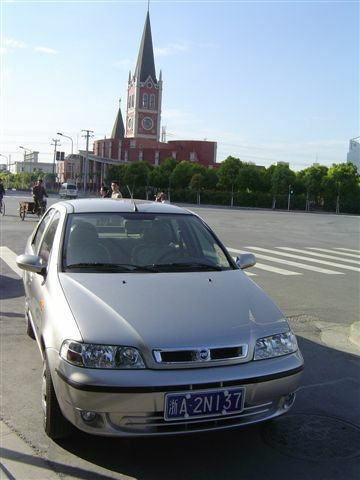 I can rest assure you, the spirit of Shanghai is in Puxi, although the nice life is in Pudong. It is all about choice. This is part two following the last article Is the Real Estate Cooling Down? I attended a conference on Investment in 2005 today. To be honest, I have very few investment and financial knowledge and I never care too much on the financial numbers such as the government debt and raise in gold price. I was surprised to see so many people concern these numbers so much. One of the argument was about the trend of real estate price. I asked the question about the real estate bubble of Hong Kong and Hainai and asked about their compare between Shanghai’s situation and other real estate crashes in the world. The host answered my question. I found it reasonable. Regarding the crash in Hainan, it was not an economy crash. It was purely cheating. No houses were built after the real estate developer got the money. They spent it elsewhere. The biggest difference between Shanghai and Hong Kong is, Shanghai is in a closed economy. Renminbi is not free trading currency. You cannot exchange Renminbi to any free trading currencies, like USD or Canada Dollar. That means, people in China cannot invest in investment with higher return. So people have to invest locally. People have been very disappointed in the stock market in Shanghai or Shenzhen. Huge amount of money goes out of the stock market. There are very few investment channels for the capital, so real estate has to accommodate the money. The money comes not only from people in Shanghai, it comes from all across the country. The number is a strong indicator that 40% of high-end properties in Shanghai Real Estate market comes from outside Shanghai. So the conclusion is, the real estate price will keep raising until Renminbi becomes a free trading currency. At that time, money will flow away. Disclaimer: It is just one of the opinion I heard. It does not represent my point of view. 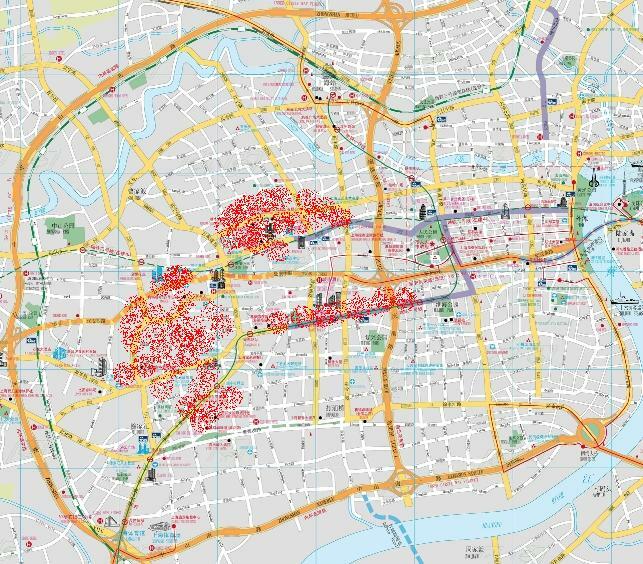 This is to follow up the hot discussion under Old Houses in Shanghai – Part II. In that post, I put one of the 35 private villas in Lane 120 of Tai An Rd. I believe that all (or most) of these houses are still state owned property. Based on the newspaper article, each two story house has about three families — not a very comfortable living condition. This actually reflects an interesting reality: There are many beautiful old houses in some very nice areas in Shanghai. But the actual condition there may not as good as it seems. JH’s comment is quite true. Most of the houses are owned by the government, not private. But it really depends. There are several types of status of the old houses. Here is a breakdown. Many old houses are in this status. I visited a house that is owned by a rich family. 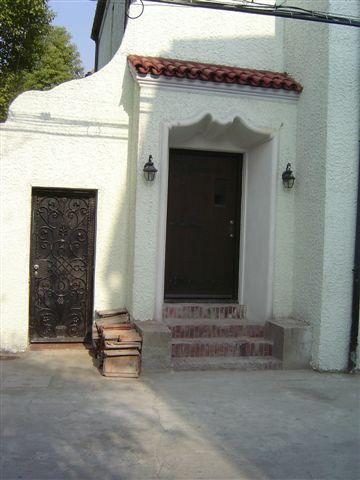 It is a three story stand alone villa on Yong Jia Rd. After the state occupied and “assigned’ many residents, the origin owner only owns the part on the 3rd floor. When we visited the house, the living condition was really harsh. Many people lives there – I remember 7 old men/women lived in the narrow space of the stairs – they have no room, just a bed put into the stair corner with simple cover. It was really hard to march to the 3rd floor. Other families occupy the rooms. In one word, it is a hell. It is a pity that the old house was very nice for one family but was too crowded with the many families living in the same house. The apartment on the 3rd floor was sold at 6000 RMB sq. meter at that time. The apartment was very good by itself, but it is unacceptable to live with so many people. You even have to pass many people’s bed before you reach your door in dark if you go back home late. There is almost no light in the stairs since they don’t want to save the electricity. If someone bought the 3rd floor of the house I mentioned, and later, persuade other families in the same house to move out (by promising enough money), then buy the whole house and decorate it, the house will be super expensive. Take this property as an example: A 350 sq. 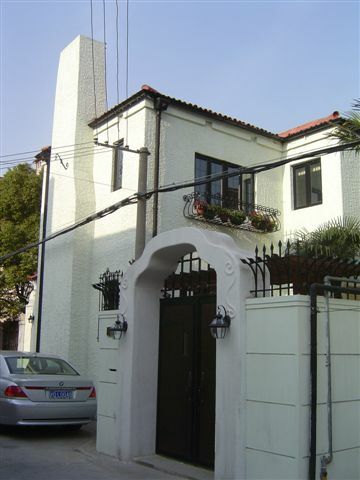 meter standalone old villa sells at 30 million RMB. It is almost 100,000 RMB/sq. meter. This is the average price of a Stand alone old villa. 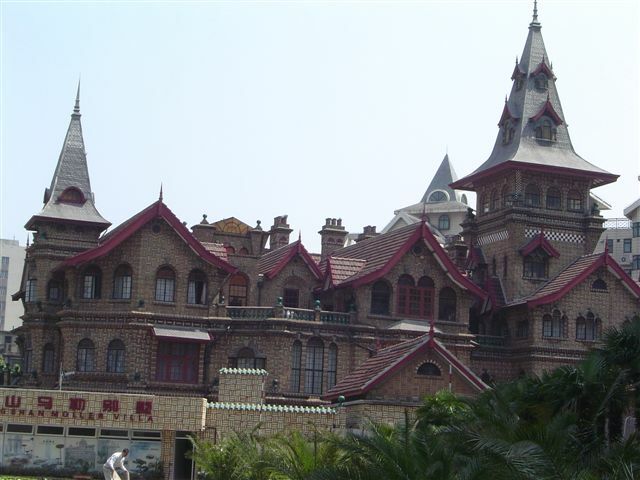 The picture I show before (Old Houses in Shanghai – Part II) is of this type. As rogi pointed out, the owner has a BMW, so only they can afford a house like this. So the key is, whether you own the WHOLE villa or part of it. If you own part of it, its price is almost the same (if now lower) than other new apartments. If you own the whole villa, the price will be 10 times higher. Look at the lane of 120 An Tai Rd. This is the view from the villa I posted before. There are many similar villas. They are not decorated so well. I suppose these houses are owned by more than one family. © Jian Shuo Wang. Villa in Lane 120 of Tai An Rd. There are some famous old villa in the city. 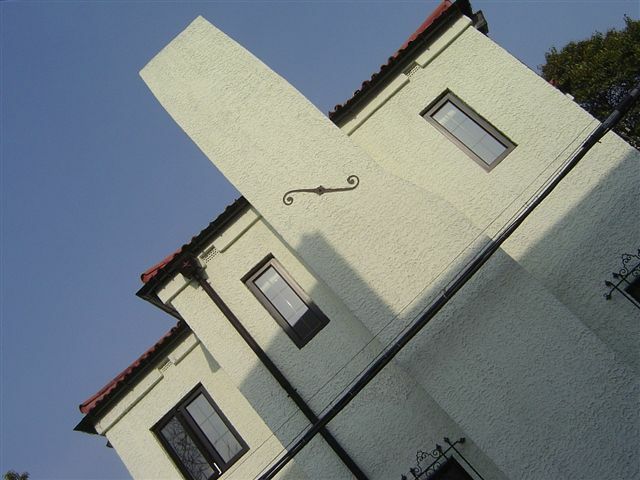 There are about 400 listed historic buildings that is under strict protection. Here are two examples. © Jian Shuo Wang; Located at 22 Pan Yu Road was the residence of Sun Ke (Dr.Sun Yat-sen’s son). © Jian Shuo Wang. 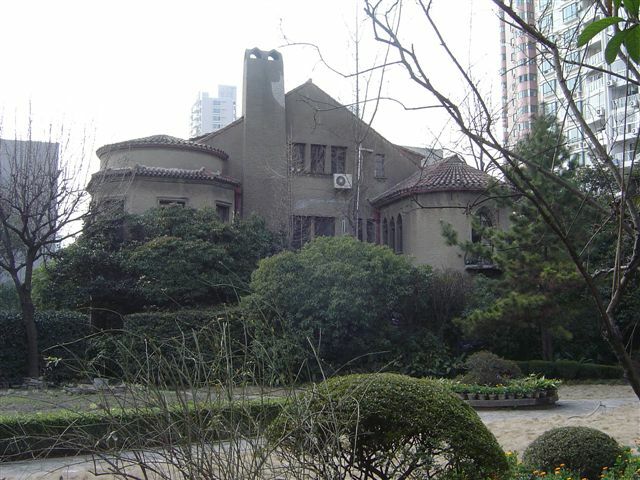 Mr. Muller’s private residence at 30 Shaanxi Road. Now it is the office of the Shanghai Committee of the Chinese Communist Youth League.